The Royal Netherlands Navy (RNLN) landing platform dock (LPD) Zr. 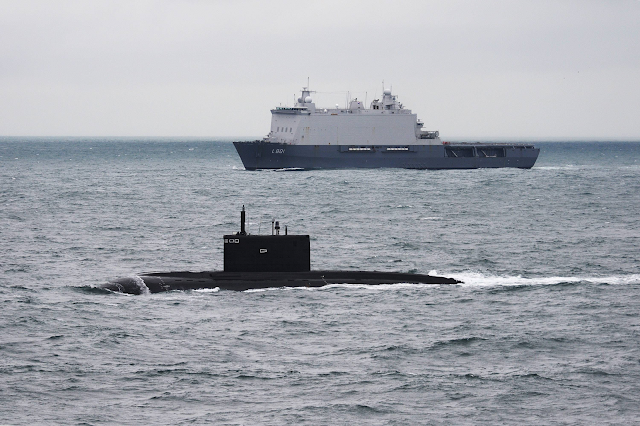 Ms. Johan de Witt escorted a new Russian Kilo class submarine through the Netherlands Exclusive Economic Zone (EEZ) in the North Sea Aug. 19, the Dutch Ministry of Defense reported. The LPD was supported by a Dornier 228-212 patrol aircraft of the Dutch Coast Guard. The Russian sub left the EEZ on the night of Aug. 18.